If you just got your new iPhone XR, iPhone XS or iPhone XS Max, the next step is getting a case to keep it safe. But why settle for a case that's just a case? Cases can charge your battery, serve as your wallet and more. Let's take a look at five cases that will protect your new iPhone —or give your iPhone 6/6s, 7, 8 or X an upgrade—and more. One caveat: Keep in mind that most cases, including those listed below, will interfere with the ability to wirelessly charge the iPhone 8, X, XS, XS Max and XR. The most common wallet-style cases are folios that fold over your phone, typically covering both the front and back. The protection they offer is basic. While they'll protect the front and back of your phone from scuffs and scratches, you won't want to play any games of catch with your phone. Some folio cases include pockets for business cards, credit cards or your ID, and some fold into a kickstand, which can be handy. 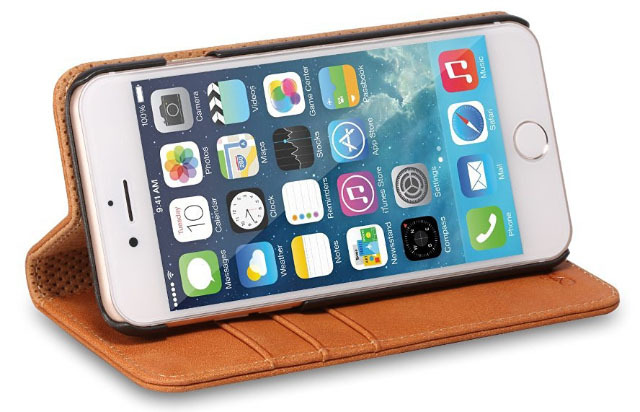 This case offers basic styling and is available only in black or tan. Assuming one of those colors is what you want, it's a solid case for a reasonable price. If you're looking for a style upgrade from the Shieldon case, this leather folio from Burkley may be perfect. Instead of a leather folio attached to a plastic shell, the Burkley is an all-leather case that wraps snugly around your phone. 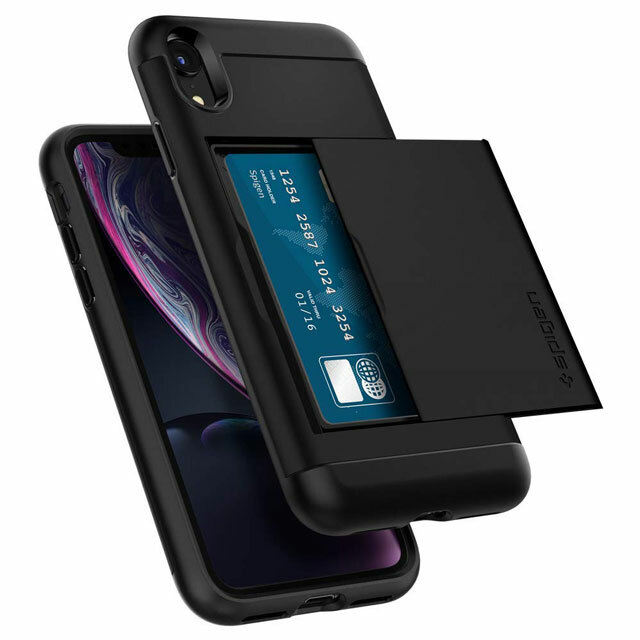 It isn't a true folio design; the back cover doesn't fold over the front of the phone, although it does fold back into a kickstand and includes slots for credit cards. 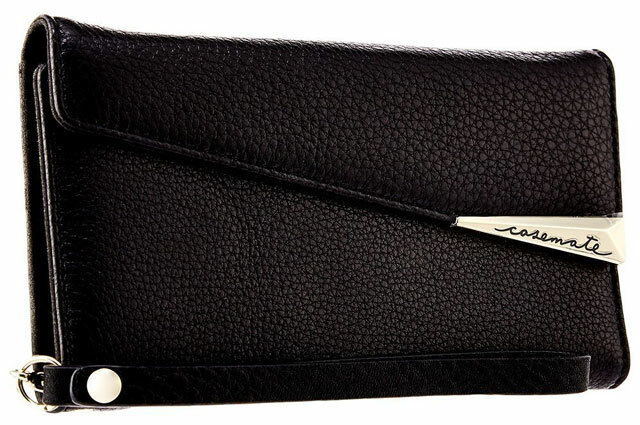 Or, you could opt for Burkley's Detachable Leather Wallet case. 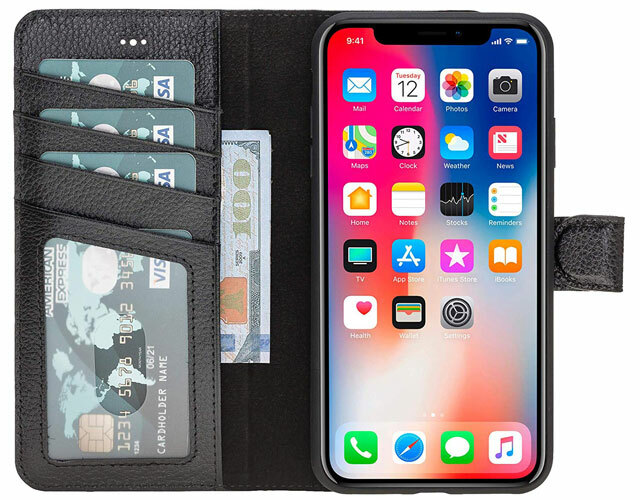 The case that attached to your phone provides full protection and the wallet uses magnets to attach. The wallet also serves as a kickstand. As you might guess from the name, the Case-Mate Leather Folio Wristlet is basically a folio case with a magnetic closure and a wrist strap. 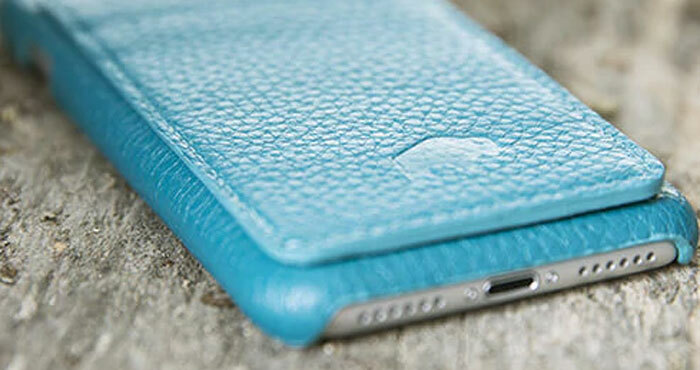 It's a leather cover lined with a soft microsuede that's easy on your phone's screen. The case holds four credit cards and has a pocket for cash. A wrist strap for easy carrying completes the case. The case comes in black, iridescent and rose gold leather. Running out of battery power is a complaint for nearly every phone owner, but you can banish the issue with the right case. The downside to charging battery cases is that they make your phone thicker and heavier, something you won't enjoy if you chose your iPhone for its slender profile. So do you want more battery power or a smaller phone? 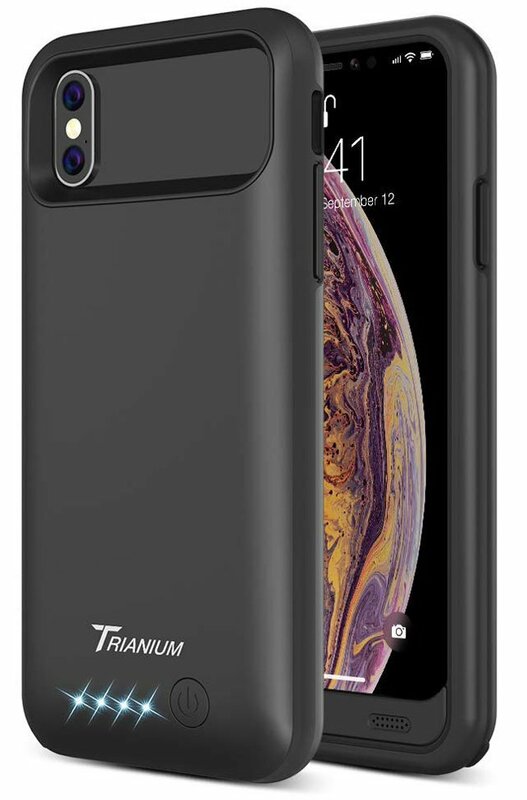 The Trianium Atomic Pro is designed to snugly fit the iPhone X/XS and iPhone 8/7. Check the battery status by pressing a button on the case, so you always know how much power you have left. The iPhone X/XS case has a 4,000mAh battery, which delivers an additional 8 hours of talk time, and the iPhone 8/7 has a 3.200mAh batter, which provides and extra 14 hours of talk time. T0 keep your phone and case charged, plug the case in with the included microUSB cable. The one downside: you'll have to use Bluetooth headphones since there is no access to the Lightning port on the phone. The case comes in black, white/gray and white/aqua. This extra-thin screen protector — it's only 0.25mm thick — is made of tempered glass, which offers the best possible protection for your phone screen. 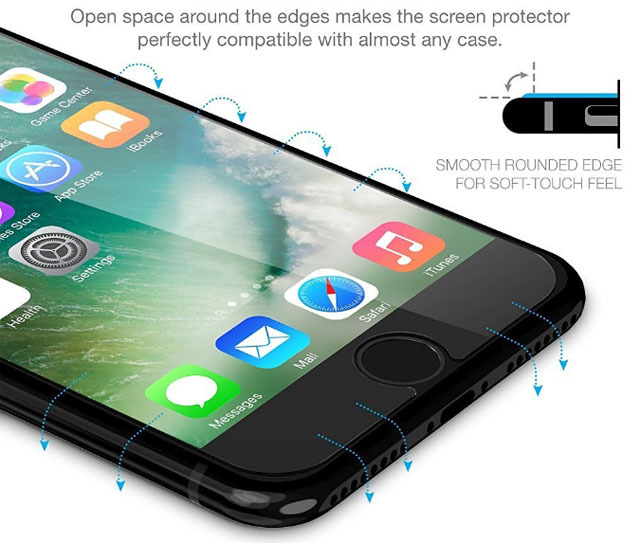 The protector only covers the flat part of the screen, not the iPhone's curved edges. That may seem like a disadvantage, but it actually helps the protector be compatible with more cases that tend to curve around the edges. Best of all, this protector resists fingerprints. Hooray! The cases with magnetic closures or attachments run the risk of demagnetizing the credit cards don’t they? Good question. I’ve contacted Case-Mate for comment on this and will let you know their answer.